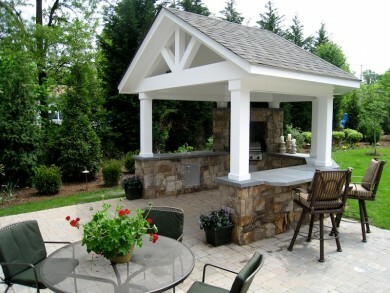 At O’Grady’s Landscape, we can custom build your outdoor kitchen in Great Falls, VA to suit your every need. From lavish cooking stations to outdoor bars with all the essentials, we’ve got the skill and experience you need for the picture-perfect outdoor living space. Request a consultation to get started today—703-533-5001! Make the most of your summer with an outdoor kitchen by O’Grady’s Landscape! From extensive kitchen setups perfect for cooking and dining to outdoor bar patios to host parties, we will tailor the design to your exact vision. Our landscape designers have years of experience in all aspects of hardscaping, and we have a reputation for excellence in outdoor kitchen installation throughout the Great Falls, VA area. Let us help you help you build the outdoor kitchen of your dreams. Contact us today to schedule your initial consultation for a design in Great Falls, VA—703-533-5001.